Cholesterol has many essential functions in the human body. High total cholesterol can put you at a greater risk of cardiovascular disease. High levels of low-density lipoprotein cholesterol (LDL) and triglycerides; along with low levels of high-density lipoprotein cholesterol (HDL) can also increase your risk of cardiovascular disease. 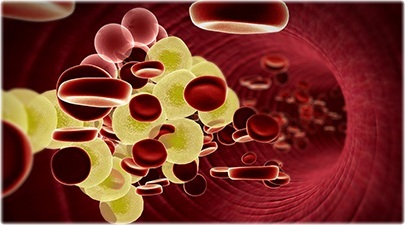 HDL cholesterol transports cholesterol away from your arteries for excretion. LDL cholesterol increases the deposition of fatty plaques on the inside of your arteries leading to atherosclerosis. High triglyceride levels subsequently increases your levels of small, dense LDLs. LDLs are the most dangerous form of cholesterol as they put you at the greatest risk of damaged arteries and subsequent blood clots that cause heart attacks and strokes. Saturated fat in the diet is the major cause of high LDL cholesterol levels. Your liver makes cholesterol from the saturated fat in your diet. Avoid foods high in saturated fats, such as cream, butter, fatty meats, sausages, processed meats and fried take away foods. Choose low-fat dairy, lean meats and skinless chicken. Use sunflower, safflower, olive or canola oils for cooking. Peanut, sesame, walnut and macadamia oils are delicious alternatives and can be added to salads or vegetables or drizzled onto fresh bread. Use avocado as a spread on sandwiches and include unsalted nuts and seeds in meals and as snacks. For example, a handful of almonds will provide you with your daily requirement of Vitamin E, which has been shown to reduce cardiovascular risk through its beneficial effects on cholesterol.5 There is quality scientific evidence for the benefits of omega-3 fatty acids in treating cholesterol imbalance. High fibre breads and cereal products, legumes, fruit and vegetables should play a major role in your diet. The soluble fibre (beta-glucan in oats) present in these foods has been proven to lower LDL levels and increase HDL cholesterol. A form of carbohydrate, known as resistant starch, also has beneficial effects on cholesterol. Resistant starch is present in ‘al-dente’ pasta, cooled cooked potatoes, and under-ripe bananas. A high intake of refined sugars, high GI foods or high GL meals results in a large insulin spike which increases triglyceride levels and stimulates cholesterol synthesis. Avoid nutrient poor, foods and drinks such as lollies, soft drinks and cordials that can increase your “unhealthy” cholesterol levels. These compounds are now available in some margarines, milks and yoghurts. They block the absorption of dietary cholesterol through the intestine, and through this mechanism, a significant reduction in cholesterol can be achieved by consuming 2-3g of plant sterols daily. This is the amount found in 1 to 1.5 tablespoons of plant-sterol containing margarines. A greater quantity does not give a greater benefit. Maintaining a healthy body weight is a major determinant of healthy cholesterol levels, with weight loss having a profound effect on your cholesterol levels. Refer to the “Weight Loss” article on the Capital Chemist web site for advice on healthy and sustainable weight loss. Smoking cessation, staying active and minimising alcohol consumption are all extremely important in the optimisation of cholesterol levels. Make your own choices to eat and live the best that you can to keep your cholesterol within a healthy range. Not only will your cholesterol levels improve, your whole body will be healthier and happier. 1. WHO. World Health Report. Reducing risks, promoting healthy life. 2002. 2. SA Fruit & Vegetable Coalition & SA Health. Facts & Figures. Jan 2008. 3. Deakin Uni ‘Diet & Disease’ lecture notes, Fontbonne A et al. Diabetologia. 1989;32:300-304. 4. Libby P. Inflammation & CVD mechanisms. Am J Clin Nutr 2006; 83S;456S-60S. 5. Braun L, Cohen M. Herbs & Natural Supplements-an evidence based guide. Elsevier Australia 2007. 7. Wardlaw, Hampton, DiSilvestro. Perspectives in Nutrition ed 2. McGraw Hill. New York 2004.